Loading "www.blog.wired.com | Printer-friendly article page"
Dean Kamen showed some video of the impressive, mind-controlled prosthetic robot arm he's invented today at D6 in Carlsbad. 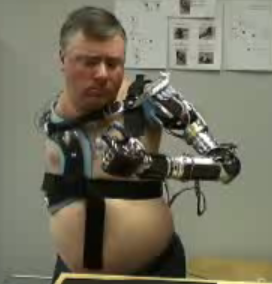 Kamen has been showing the arm off since early 2007, usually via video clips like what he showed today. But today's demonstration at D6 was impressive enough that it's got the gadget blogs and the Twitterverse all aflutter today. Deservedly so: Kamen's arm, dubbed "Luke" (after Skywalker, I assume), is an incredibly sophisticated bit of engineering that's lightyears ahead of the clamping "claws" that many amputees are forced to use today. The arm is fully articulated, giving the user the same degrees of movement as a natural arm, and is sensitive enough to pick up a piece of paper, a wineglass or even a grape without mishap. D6 posted the videos above, which contain highlights from Kamen's remarks and demonstrations of the arm itself.